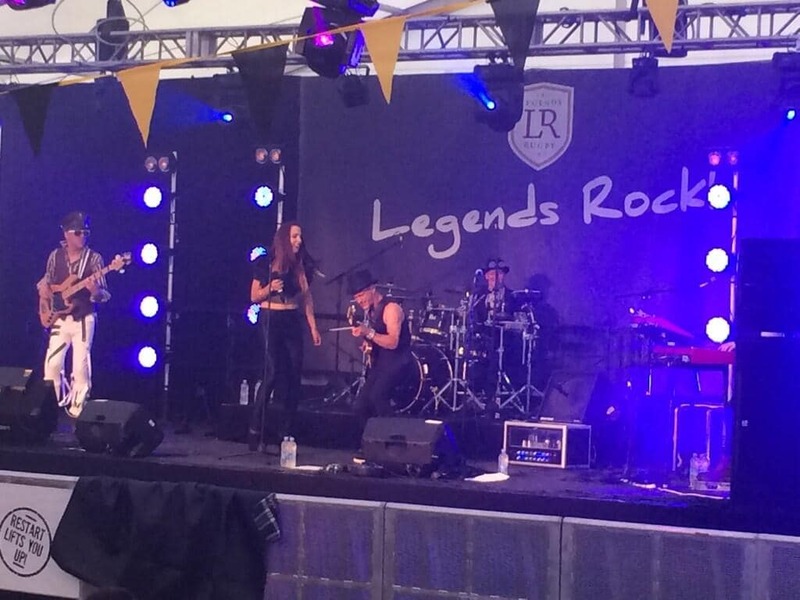 The RPJ Band played the Wimbledon Rugby Legends event in 2013 and when the client came to ask who we recommended for 2014, we didn’t hesitate in suggesting JellyHammer! So on a sunny and warm Saturday in July, five Jellies made their way to a rugby field split into several pitches and separated by beer tents! The event was even bigger than 2013 and the atmosphere was amazing, it’s a real fun day out for the whole family and the food and drink certainly flow all day long! With the exception of a torrential downpour that threatened to bring down the beer tent and stopped play on the pitches, it was a glorious day! DJ Marie Claire entertained the VIP tent with Balearic chill out tunes with a touch of Latin house – everyone in that tent was relaxed and enjoying themselves for sure! Once the rugby final was nearing its conclusion, it was JellyHammer’s turn to take the stage in the main tent! The party was well under way and rugby fans young and old danced and sang the evening away! There was even a request thrown at the stage – JellyHammer didn’t even blink as they launched into Don’t Stop Believing – and the crowd went WILD!!!! Our fabulous clients looked after us all so well throughout the day – we’re definitely keen to come back in 2015!! !